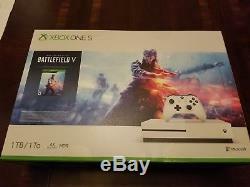 Microsoft Xbox One S 1TB Console - Battlefield V Bundle (Digital) BRAND NEW Factory Sealed with. 4K Ultra HD Blu-ray - White. Brand New & Factory Sealed. 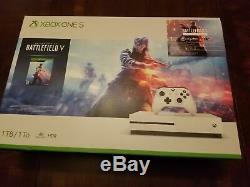 Xbox One S 1TB Console - Battlefield V Bundle Includes. Xbox One S console, includes a full-game download of Battlefield V Deluxe Edition, with paratrooper apparel, special assignments, and weekly Airlifts. Battlefield V full game download playable upon release; play trial now with included 1-month EA Access. Also includes full-game downloads of Battlefield: 1943 and Battlefield 1 Revolution, which includes Battlefield 1, the Premium Pass, the They Shall Not Pass expansion, the In the Name of the Tsar expansion, the Turning Tides expansion, the Apocalypse expansion. As well as 14 Superior Battlepacks, 14 unique dogtags, the Heroes of the Great War bundle, and priority position in server queues. Battlefield 1943 playable online only. Xbox Live Gold and Xbox Game Pass. Includes: 14-day Xbox Live Gold Trial - connect and play with friends and family on Xbox Live, the most advanced multiplayer network. 1-month Xbox Game Pass trial - enjoy 100+ games right out of the box with a 1-month Xbox Game Pass trial. Join the ranks with Battlefield V.
Enter mankind's greatest conflict as Battlefield goes back to its roots: World War 2. Join the ranks with a full-game download of Battlefield V Deluxe Edition, supporting HDR graphics. The Deluxe Edition includes paratrooper apparel, special assignments to test your skill, and weekly items coming with Airlift. The best value in games and entertainment. Whether you're rallying your troops, watching 4K movies, or streaming gameplay, there's never been a better time to game with Xbox One. The only console designed to play the best games of the past, present, and future. Play over 1,300 games including more than 200 exclusives and over 400 classics from Xbox 360 and Original Xbox. Xbox One is the only console to include a 4K Blu-ray player and 4K video streaming. Watch 4K Blu-ray movies and stream 4K video on Netflix, Amazon, Hulu, and more and experience richer, more luminous colors in games and video with High Dynamic Range technology. Connect and play with friends and family on Xbox Live, the fastest, most reliable gaming network. Find friends, rivals and teammates in the best global gaming community. Xbox Live is the most advanced multiplayer network and provides steady gameplay and fast downloads. Compete, connect, and share across platforms with gamers on Xbox One and Windows 10. Get 2-4 free games each month with Xbox Live Gold. Get exclusive offers like unlimited access to over 100 games to start playing right away. Xbox Game Pass gives you instant, unlimited access to over 100 highly-rated and fun games, with new games being added all the time. Experience hundreds of legendary games from all Xbox consoles with backward compatibility. Enjoy the freedom of Xbox Play Anywhere games on both Xbox One and Windows 10 PC at no additional cost. Xbox One games and accessories work together. 1-month Xbox Game Pass trial with access to over 100+ games. 14-day Xbox Live Gold trial. Full-game download of Battlefield 1 Revolution. Full-game download of Battlefield V Deluxe Edition. Full-game download of Battlefield: 1943. Matching Xbox One wireless controller. Xbox One S 1TB console. The item "BRAND NEW Microsoft Xbox One S 1TB Console Battlefield V Bundle Factory Sealed" is in sale since Saturday, March 16, 2019. This item is in the category "Video Games & Consoles\Video Game Consoles". The seller is "kbtuning" and is located in Central USA. This item can be shipped to United States, Canada, Mexico, Bermuda.